A Boutique Digital Network Designed Exclusively For The Door County Enthusiast. Because 99% of Door County lovers aren’t here 99% of the time! Join us and reach many of them through our digital channels. Our 2015 Wish Book is archived, still live & still getting views. From big smart TVs to mobile. ● A full page, full color, live interactive 5 week ad page with a live link to your site. offer etc.. pulsated out across the country to a large community of Door County enthusiasts while they dream about & plan their next visit. ● Enjoyable on all devices, and designed especially for big smart TV’s. ● Zero paper waste with this product. ● Sell gift packages, gift certificates, stay & play packages, News Years Eve offerings, products, experiences, build brand awareness, sponsor a non-profit page, sell tickets as gifts through your site our or sell through ours; ShopAllDoorCounty.com™ Traffic pointed back to the site of your choice. ● 10 days of direct ad buys though our Door County Social Network™ specific to you offering, page, product, experience etc. ● Reg. Just $350 for the above ad product. This package allows you the additional option* to sell your Gift Certificates in Tracy’s downtown Holiday Pop Up Shop and also online nationally in her ShopAllDoorCounty.com store. Gift cert. are easy to send (mail). The previous Wish Books (2) The Holiday & The Dreaming are still live and archived here. DoorCountySocial.com Engaged with in over 500 cites. Last years Holiday Wish Book was engaged with for 8 minutes and 6 sec. on average. ● A *4 page live interactive digital brochure for 365 days $365 (design included during this holiday season special). Links included for you to use and the brochure will be included in our proprietary national discovery platform. DoorCountyBrochures.com™ Zero paper cost or waste. ● Anytime digital ad buys through our Door County Social Network™ custom to your needs. *With a small additional transaction fee. The 2015 ‘Live’ Holiday Wish Book was a big success. Digitally broadcast in multiple waves locally, regionally and nationally. Enjoyed on all kinds of digital devices. Designed a visual ‘entertainment’. Enjoyed In Hundreds Of Cities Around The United States. 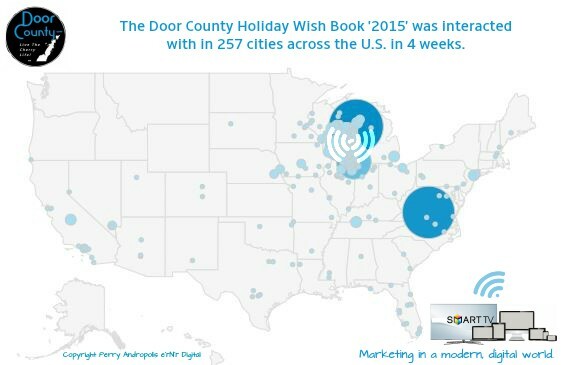 The Door County Dreaming Wish Book is now live. Reach the enthusiasts while they are dreaming, planning scheming their next visit to Door County over the winter. Be discovered – get on their ‘digital’ radar. 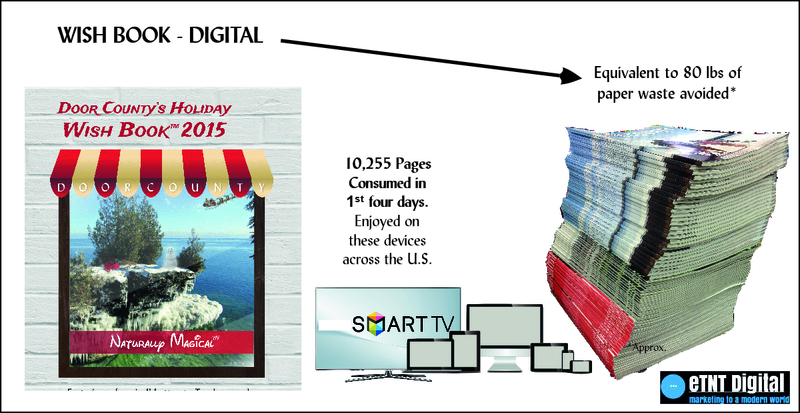 A pulsating (across the country) full page full color interactive ad page. With a live link back to your opportunity for real time action/inquiries/lead generation. You also have the option to embed an existing video about your effort. To Be Considered For National Publication. Door County Enthusiasts, have your pictures, poems, qoutes and more considered for publication nationally for the upcoming Holiday Wish Book. Winter and holiday themes encouraged. We are also considering Door County poems, quotes and short stories and videos. Please send to tracy@etntdigital.com Smart phone quality photos are of course considered.